Pure Chamomile for Blonde Hair: Our Process Method. Choosing chamomile for our hair products is a precise process. First, we only use the best quality flower tops, hand-picked and ground. We discard the ones that don’t match our quality standards. After the selection process, the flower tops are macerated at 35º through our process of bio fermentation. After a couple of hours, we take the flower tops of chamomile along with their organic broth and put both within a glass press maker machine. A cold process and glass materials are the most effective way to ensure we obtain all of the best chamomile properties. First we extract all of the active ingredients with a single press. The resulting oil is then separated so that some of it will be refined twice and the rest will not be refined at all. Next, we add our shampoo ultra-delicate base, made out of selected fresh plants. Everything is mixed and we let it rest for a day to be bottled in a PET 1 quality bottle. The refined product will have a golden color and the unrefined will look more opaque. Both products maintain all the beneficial properties of chamomile and characteristic fragrance. 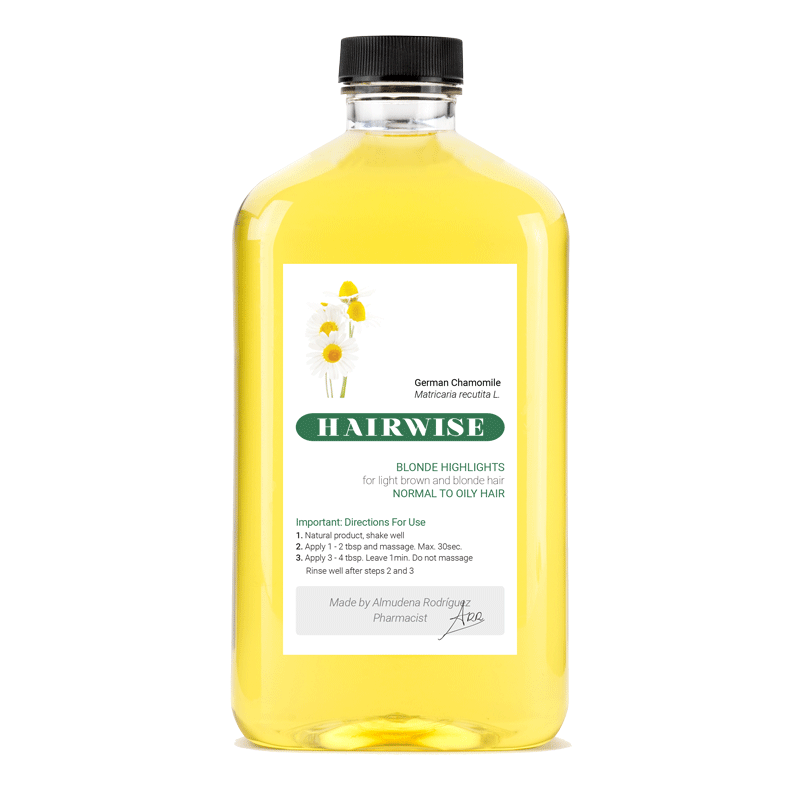 Unrefined chamomile shampoo increases hair’s softness and nourishment. It is recommended for dry hair. 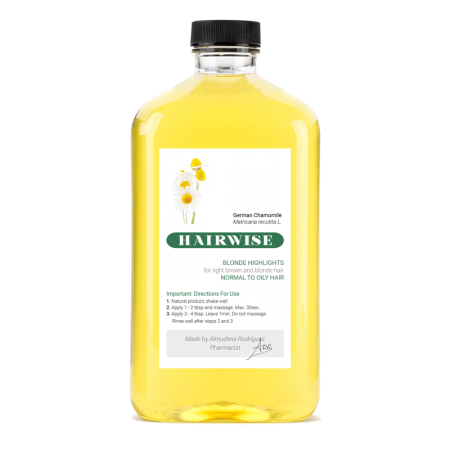 Chamomile refined shampoo, with its double filtration system, will brighten hair in a similar fashion to the unrefined shampoo, but without increasing nourishment. This formulation is indicated for normal to oily hair. Both refined and unrefined shampoos can brighten brown and blonde hair, whether the color is artificial or natural. Color will be transformed to a golden blonde. Purified Water(Aqua), Coco Betaine(coconut derived), Decyl Glucoside(plant derived), German Chamomile (Matricaria Recutita), Quaternium 80, Triticum vulgare (wheat germ oil), Juniperus Communis(fruit), Pinus Montana(needle), Abies Alba(needle), Melaleuca Leucadendra(leaves), Melaleuca Viridiflora(leaves), Pimenta Acris(fruit), Salvia Officinalis(leaves), Coríandrum Sativum(fruit), Lavandula Latifolia(flower), Acorus Calamus(root), Carum Carvi(fruit), Anethum Graveolens(fruit), Lavandula Angustifolia(flower), Citrus Dulcis(orange peel), Citrus Medica Limonum(lemon peel), Myristica Fragrans(seed), Pinus Pinaster(leaves), Eucalyptus Globulus(leaves), Mentha Viridis(leaves), Thuja Occidentalis(leaves), Rosmarinus Officinalis(leaves), Origanum Majorana (leaves), Chamomilla Recutita(flower), Juníperus Virginiana(leaves), Tocopherol(vitamin E), Phenoxyethanol (preservative), Lemongrass (preservative from Cymbopogon Schoenanthus Extract), Honeysuckle (preservative from Lonicera Caprifolum).